We have a fresh crop of new info about the Microsoft Xbox 720 / NextBox from sources that have experience of the development hardware, including a the CEO of Ubisoft Montreal and the CEO of GameStop. 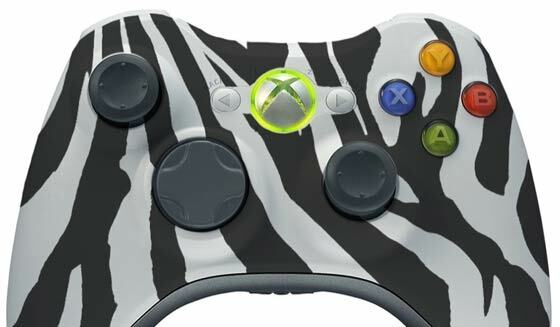 A lot of the new information concerns the new game controller which reportedly hasn’t had much in the way of changes to its functionality or layout but is reported by Kotaku to feature a kind of bizarre organic zebra-style paintjob. Kotaku cites no less than “four unrelated games industry sources” that have confirmed the design of the new Microsoft NextBox controller to be very similar to the current Xbox 360 controller design. “Same two analog sticks in the same upper-left/lower-right position, same positioning of the d-pad and face buttons and forward and back buttons. Triggers. Bumpers. Top-center power button. It all seems to be the same...” However the controller is said to be slightly smaller than the current version. Turning to additional interfaces and sensors, as integrated into other recent new rival console controllers, the Xbox 720 controller eschews all that frippery. There are no new buttons, touch sensors, motion sensors and definitely no screen built into the unit. Now what is it with the bizarre zebra-style paint-job? Kotaku has heard that all the NextBox controllers feature a black and white striped design. The writer speculates that these are all slight variations, forming a kind of controller fingerprint. With a record of these “fingerprints” Microsoft would be able to track down any leak source quite easily. You can see Kotaku’s mock-up example above. I also read today via MCV online that GamesIndustry International has interviewed GameStop CEO Paul Raines. Raines was full of enthusiasm for the new Microsoft Xbox. “We've been spending a lot of time with Microsoft, but we have to let them take the lead on this, but it will be a very hot, compelling device. They are doing some really cool stuff, and I'm eager to hear them start their announcements because I think the world is going to stand up and take notice,” commented Raines optimistically. How hot and compelling will the new Xbox 720 be? According to Yannis Mallat, Ubisoft Montreal CEO, it will be about as “hot” as the Sony PlayStation 4. This is because the Microsoft console’s specifications will be approximately “aligned with what Sony announced”. Mallat added “It's really going to be amazing. Trust me on this one”. Now what is it with the bizarre zebra-style paint-job? Kotaku has heard that all the NextBox controllers feature a black and white striped design. The writer speculates that these are all slight variations, forming a kind of controller fingerprint. With a record of these â€œfingerprintsâ€ Microsoft would be able to track down any leak source quite easily. Ooh, that's sneaky - like it. How hot and compelling will the new Xbox 720 be? According to Yannis Mallat, Ubisoft Montreal CEO, it will be about as “hot” as the Sony PlayStation 4. Can't see why they'd need to change the XBox controller - personally I think it's about right. Heck, even bought one for my PC. Not that keen on the PS3 controller for some reason though - doesn't feel as comfortable to hold. im glad that theyre making the controler a bit smaller, its the only thing that really put me off the original xbox and the 360, the ps3 controler is just the right size (i have tiny hands) and the xbox one has always been hard to reach the middle, the X button and the start etc, i have to move my hand almost ontop of the controler to reach it…seems a bit…much..
so if they reduce the size by about 25% it should be about perfect. From a glimpse in a dark and grainy youtube video? Somebody needs their tinfoil hat adjusting. They did once make Xbox mini 360 controllers which were more geared towards kids, dont they do them anymore?